Hello Friends! I finally decided that I couldn't wait for time to become available, and I would just make some! I decided to get my fingers all covered in ink this weekend...and that's exactly what happened. 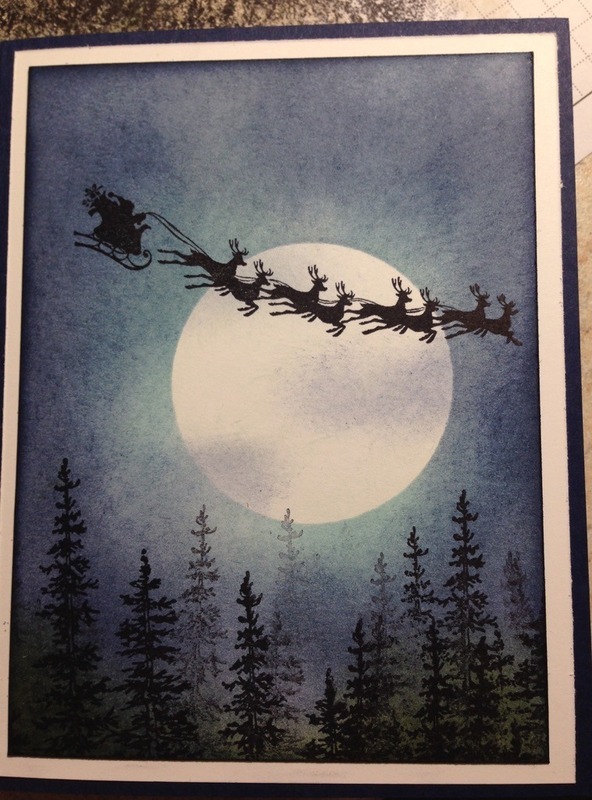 Here is my first card in a long time, and I decided to make it a Christmas card. Yes, it's only October, and I somehow skipped over Thanksgiving, but I will come back to that later. Promise! Here is what I came up with! 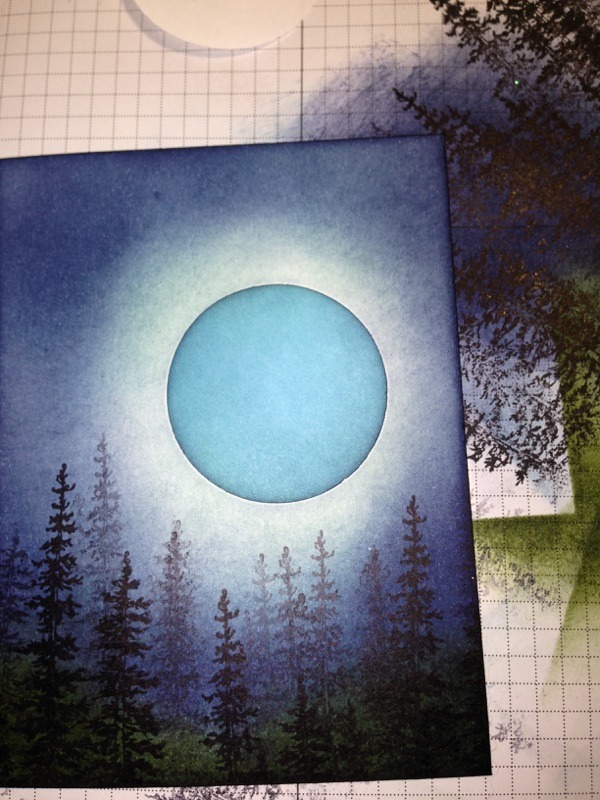 And today, I am also going to include a photo tutorial. On a 3.75" x 5" piece of Whisper White cardstock, using your sponge, lightly sponge on Soft Sky ink. 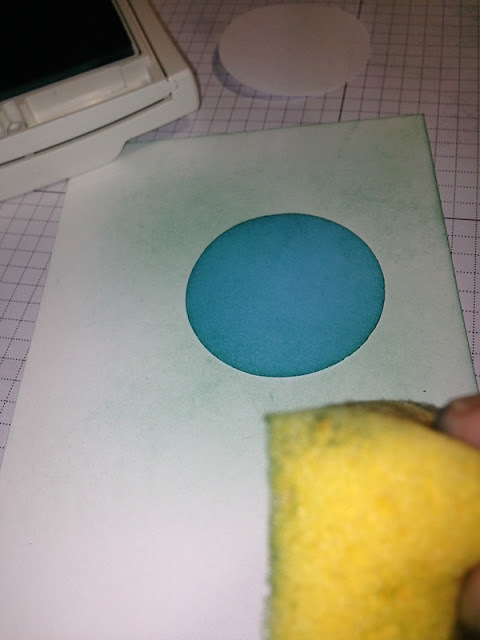 Generally, I do this by inking up my sponge, sponging on scratch paper and then rubbing in from the edges until the entire cardstock is covered. Something like this. 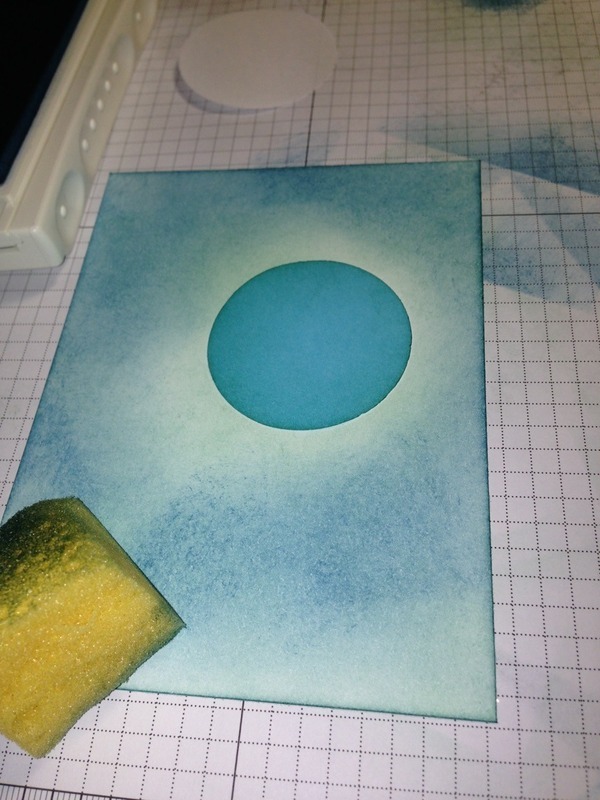 Punch out a 2.5" circle on a post-it, making sure to get some of the adhesive strip. Adhere this to the cardstock face. 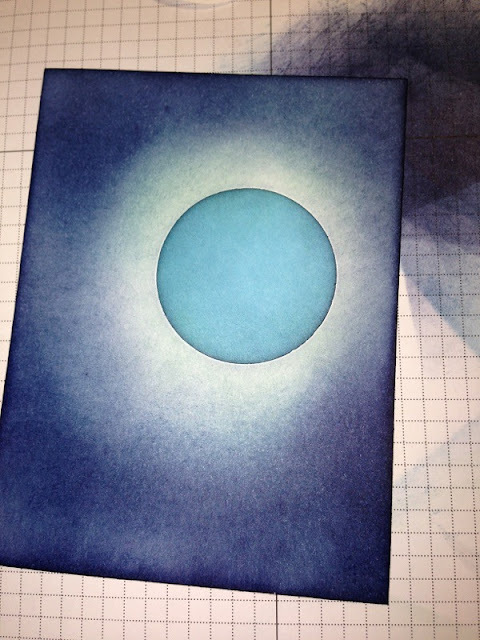 This will be your moon. Make sure from here on out, you keep this firmly in place as you continue to add layers of ink. The next color of ink will be Pool Party. 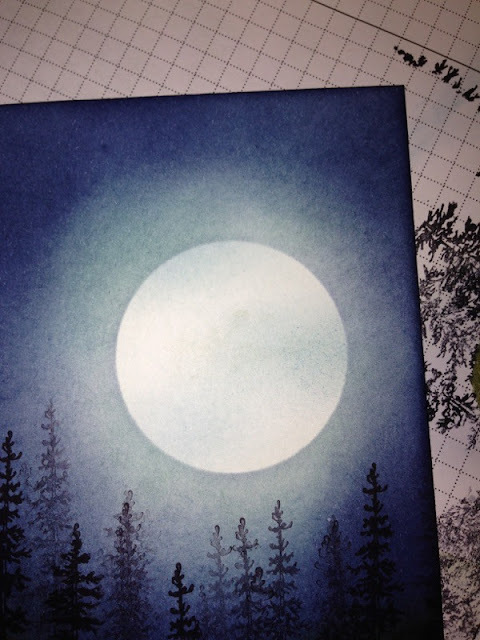 Once again, start out the outside edge and work in towards the moon. Try to leave some space around the moon, to form a halo. Use your best judgment on this, to find the tone you like the best. 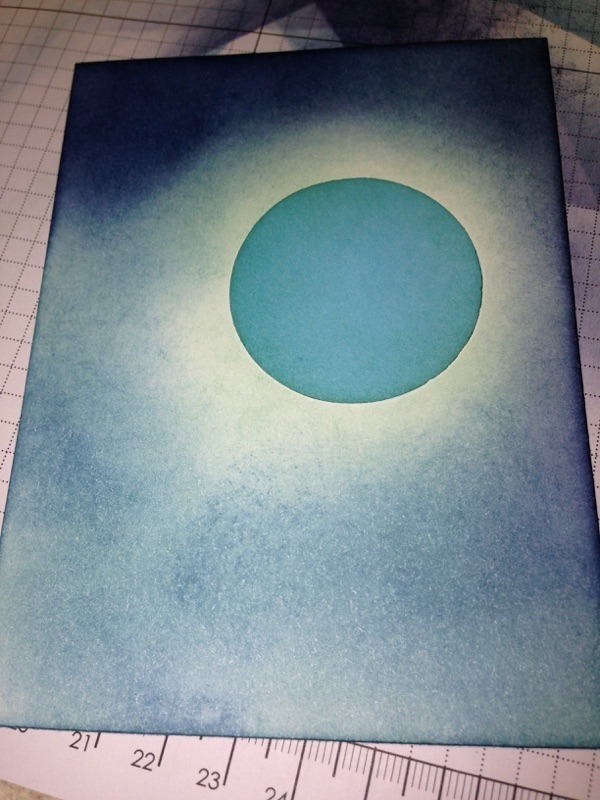 The next layer of ink will be Marina Mist. Using the same technique as before. Blending and blending by rubbing in circles, makes a nice blended and burnished effect. The final color for the night sky is Night of Navy. Be careful and add light layers of this color as it can be very dramatic. I love the effect though! As you can see, starting from the outside on all edges and working into towards the moon halo, will give you the best effect. Now we will be adding the illusion of land. Using your sponge, dab into some Mossy Meadow ink and rub it into the bottom section of the card. This will give our trees a place to land so they won't look as though they are floating in space. 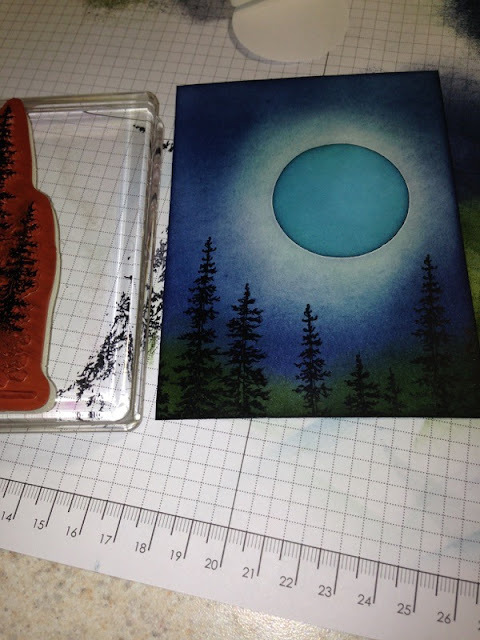 Using the tree stamp in the Wonderland Stamp Set and Archival Black ink, it's time to stamp the trees in the foreground. 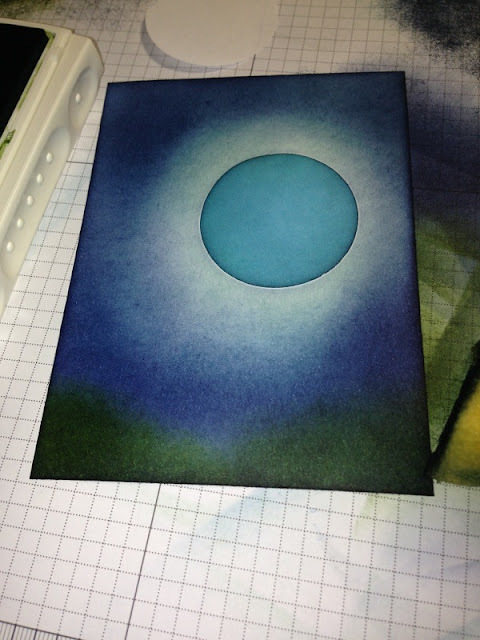 These will be the darkest color and you will NOT want to stamp off your ink first. Place the trees in varying heights for more interest. To give the illusion of depth it's now time to add the trees in the background. 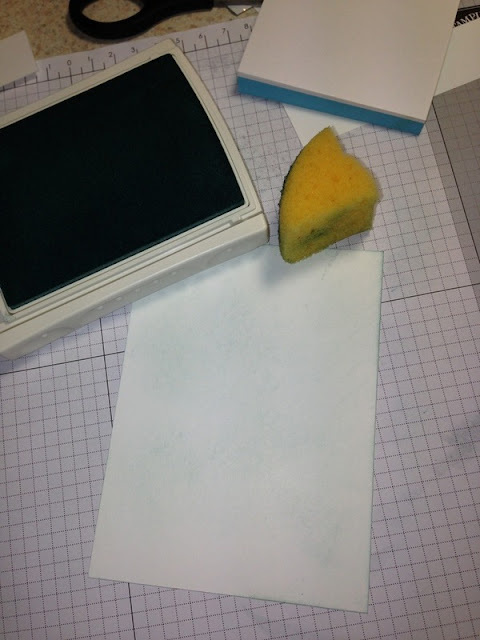 Do this by inking your stamp and stamping off onto your scratch paper one time. Randomly stamp in the gaps in between your foreground trees. You should be able to get 2-3 trees from one inking. Now you can remove the post it moon from your cardstock. 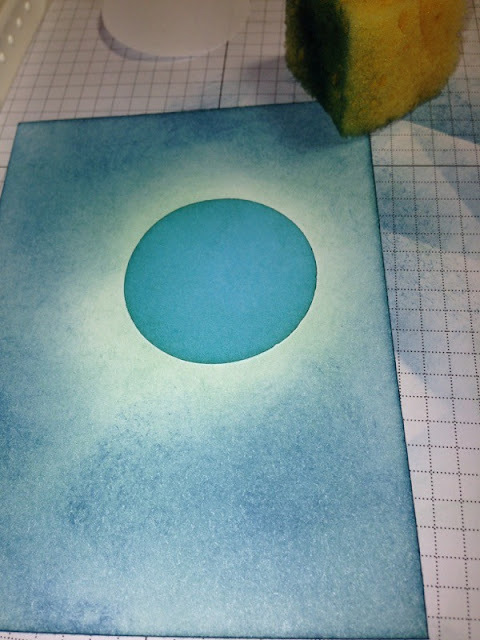 Using the sponge, lightly add some shadows (or hazy clouds) over your moon. Nice effect, isn't it? 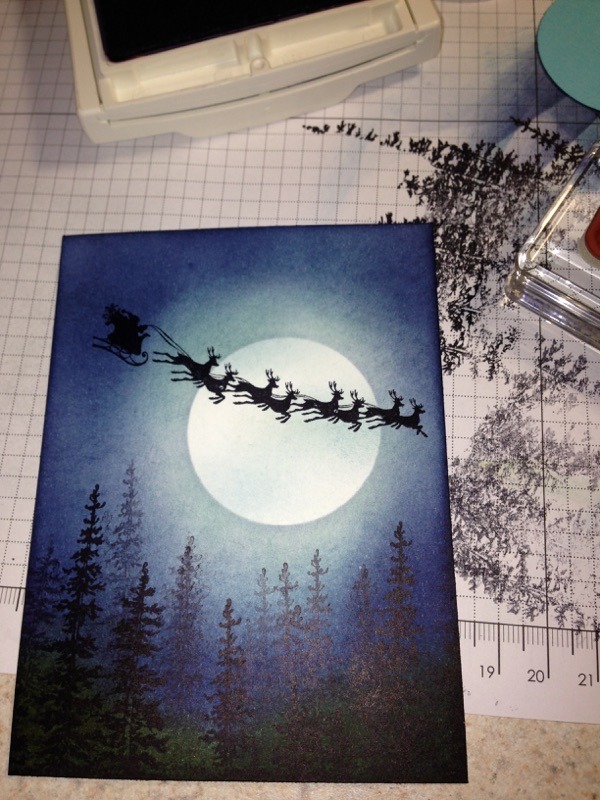 Using Santa and his reindeer stamp from the Cozy Christmas Stamps set and Archival Black ink, stamp your image over the moon. 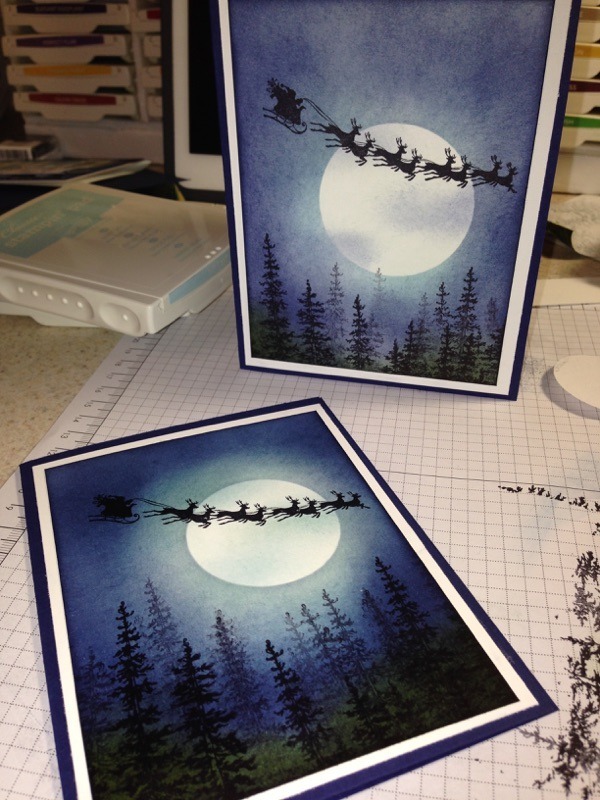 Finish your card off by mounting it onto Whisper White cardstock and then onto a Night of Navy card base. I think a sentiment stamped onto vellum paper would be a nice touch for the front, but I don't have any vellum and I kind of like it just the way it is. However, inside the card, I would recommend adding some Whisper White card stock and a sentiment to finish off your card. What do you think? Was this tutorial helpful? This method would work with just about any sky or background effect you are going for. But, if you'd like to duplicate and want to purchase the materials, you can do so with the links I will include.